Home » Podcasts & Blog » 170 – The Power of the Principles – How to improve your life today! 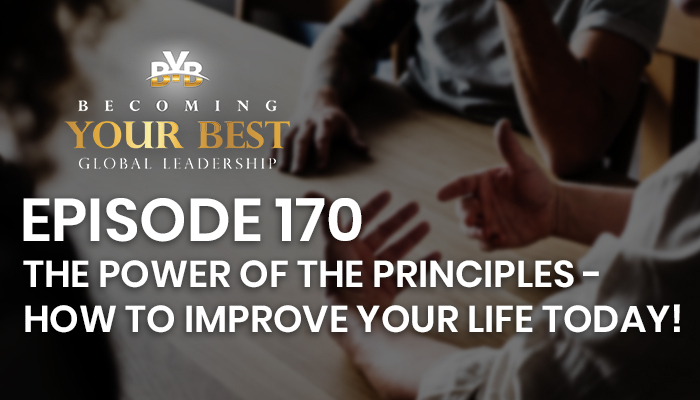 170 – The Power of the Principles – How to improve your life today! Rob Shallenberger: Alright friends, welcome back to the Becoming your Best Podcast. This is Rob Shallenberger, wishing you a fabulous day, wherever you are in the world. And I know there are listeners in the Philippines, Africa, Europe, Central South America, and so we welcome you wherever you’re at and hope you’re having a fabulous day! Just a couple of things before we get going. Number one, many of you may be aware, yet I know some aren’t aware, that we just launched The Becoming Your Best University. This is an online resource that you can use and access tools from all over the world. If you go to becomingyourbestuniversity.com you’ll have access to a lot of different courses. Some of them are free. For those who are serious about their success, there’s some paid courses, where you can invest in yourself, that has all the templates, the tools and this is something you can watch on your own free time, so we’re excited about this. People have been asking about it for months, and so finally, it’s here, and we will continue to release online courses, through the upcoming months, and certainly, years. So for example, the Breakthrough Leadership Conference is currently on there, and we’re gonna re-record this upcoming April Conference and put that on there. Our Entrepreneur Conference is available, a Sales course. So anyone in sales should watch this Sales Course and we’ll talk more about that. It will be released here in the next week or so. These are powerful courses. So, becomingyourbestuniversity.com, great place for you to access tools from anywhere in the world. Rob Shallenberger: Now in this podcast, this may not take a long time, yet I hope it resonates with you on a deep, personal level. There’s a couple of things that have had a big impact. I’m gonna share what I would consider the bigger of the two, for the latter part of this podcast, in just a few minutes. Rob Shallenberger: The first one though, something that has been really interesting though, over the last few days, is your personal health progress fitness and performance. Something that I’ve learned personally about that. And this question is, how do you measure your personal health progress and performance? Some things are fairly easy to measure. Others, not so easy, and a little bit more difficult. The foundation of this is to have your vision, your roles and goals, and combine that with pre-week planning. If you don’t know what I mean when I say those three things, go to the Becoming Your Best Univerity and get some of those free courses on how to do that. A lot of people listening to this podcast will understand what I mean by that. So that is the foundation: roles, goals, pre-week planning. The target is critical. Michael Phelps, the Olympic swimmer said his secret to success is that he has his goals next to his bed and when he wakes up in the morning, the first thing he does, is he looks at his goals. So I wanna lay that as the foundation. We need to know where we’re going, what the targets are and what matters most this week. Rob Shallenberger: Assuming that that’s the foundation, there’s another layer that can take even a step further or a little bit deeper if you wanna look at it that way. And that is, to get some sort of watch that allows you to track your progress. Now, I recently invested in a Garmin watch and I returned from Africa, it was there waiting for me, I was all excited to get this, and so far this week, I’ve done certain things as it relates to health and exercise that I haven’t done for months. And there’s a power in this principle. In business, we say, “Don’t get mad, get the data.” Well, how about in our personal lives? If we’re wanting to have better health, and there’s certain things we want to improve, let’s not get mad. We assume that the goal is there, we know the target, now let’s get the data. And having the data can add another level of accountability, that’s very powerful for us. So, for example, my Garmin watch tracks steps, sleep and even tracks deep sleep. There’s a little app on it that has a seven-minute workout with the watch. And ironically, I may be breathing a little fast right now. I just finished a workout with Murphy. I walked downstairs in the office, asked who wanted to work out, and Murphy, enthusiastically raised his hand and so we did a seven-minute workout together. That was because of my watch and I knew I needed more intensity minutes than I got yesterday. It has your average heart rate and so on. The point is, whether it’s a Fitbit or a Garmin watch, whatever the brand is, having the data here motivates you to do certain things that otherwise we may not be motivated to do. I mean, just last night, I go home, spend time with the kids, had a great afternoon, evening, and then realize, looking at my new watch, that I was still a couple of thousand steps short of the target for that day. So at 7:00 PM, I grabbed my wife and we walked out and went on a maybe 15-20 minutes walk, together, simply to get those remaining 2000 steps. Now, would I have done that, had I’d not been tracking on the watch? It’s a good question. I’m still in line with my goals, without having gone on that walk. Yet, having that data was an extra motivator. So, the reason I’m bringing this up is, if you want to improve your health, if there’s something that you want to do better that relates to your physical body development, lose weight, lower your heart rate, whatever it might be, then get a watch or a Fitbit or something that allows you to track that data. For me, even in four days of having this, has been monumental in helping me shift the way I think towards accomplishing my goals. Rob Shallenberger: And then, there’s another layer to this. This could be a blessing and a curse because you also can get texts, and phone calls on this smartwatch and that can be a huge distractor. That can clutter up your life even more if you’re already living a high stressed life. So on that note, yes, I’m highly recommending one of these watches, or devices that can help you track this data; at the same time, if you already feel like you have a pretty high-stress level, then you may wanna deactivate that function that allows you to receive texts and calls on your device. That’s really up to you. But if you’re already feeling moderate to high stress, there’s no need to add another layer of stress. It’s important to disconnect at different times. So that one’s up to you. I’m just gonna throw that out there because I’ve seen a lot of people say, “Yes, I got this awesome watch, it’s doing all these amazing things, but I can never disconnect.” Well, set it up from the beginning, so that there are times when you can disconnect. So that’s number one. This has been for me awesome last four days, as I mentioned. If it’s something that you feel like would be valuable to you, then consider going out and getting that. See what impact it has. See if it works for you. You know, what’s the worse that could happen? It doesn’t do anything. Rob Shallenberger: Number two, and what I consider to be the more important part of this podcast, is this reminder for all of us, of the power of the 12 principles. And sometimes, after we’re around them for a while, we’re listening to these podcasts, we get the weekly email; in our case, we’re speaking and doing seminars all over the world about them, it may potentially be easy to get a little bit numb. In other words, it might not be too difficult to get complacent about these principles. We think about them, we talk about them, and they might just become sort of an after-thought, whereas, at one point, they had a fire that came with them. Well, we’ve gotta guard against that, because these are powerful principles, and we never arrive, so to speak. These are something that should be a part of our lives throughout the rest of our lives. For example, let’s just take our personal vision. You’ve heard us talk about that over and over, so many different times. Well, I’ve had a personal vision written for years and for any of our Becoming your Best listeners, you know we invite you to develop a personal vision by role. Parent, spouse, whatever your title is, at work. What does your very best version of you, look like? And using empowering words, such as “I am”, rather than “to be”, “hope”, “someday”, things like that. Well, with the vision, you know, I’ve had it for years, it could potentially be easy to start to get a little complacent about it. Well, let me share with you some things that I’ve done to bring the power of the principle back alive, so to speak. Rob Shallenberger: I started treating my vision a little bit differently, recently. So, for example, rather than just having it written and reviewing it once a week, even though I have it memorized, I’ve started treating my vision like an affirmation. And so you’ve heard on different podcasts, when we’ve mentioned the Becoming Your Best morning, for example. What goes into a powerful morning routine and how to start the day off right? One of them is, when we open our eyes, to simply stay in bed for three to five minutes, and start to verbalize different affirmations. If someone’s sitting next to us, sleeping, well, then maybe we can do it in our mind. But the idea is to say them out loud and let them become a part of who we are. That we align our thinking with our reality and vice-versa. That’s the beginning part of it. Well, as soon as I started treating my vision like an affirmation, it became very powerful. It brought a whole new life back to the principle. Rob Shallenberger: So let me give you an example of what my vision is as a father, and as a husband, or as a spouse. So, as a husband, this is my vision in that role, and this is what I got up reciting this morning, and it already started the day off with that power. Is like planting the seed for the day. So here goes, “I’m a kind and caring husband, who always helps Tanya feel like a 10. I’m totally faithful in thought and action, and I constantly strive to compliment her, serve her and be the husband of her dreams.” As soon as I recited that two or three times, I looked over and there she is. How am I going to treat her, after using that as an affirmation? Immediately I’m already asking that question. What can I do to make her feel like a 10? See how the vision becomes a guide, and it brings the power to it? Well, how about in the role of father? “I am an example in thought and deed, of what a true gentleman looks like. I am the type of person I want my daughters to marry. I’m present with my children and we constantly develop great memories together. I help them see their potential, and how they can make a difference in the world and I am vulnerable and I empathize with them.” So as we wake up in the morning, the question is, what does an incredible father look like? What type of person would I want my daughters to marry? How am I gonna treat them, this morning? And so, when you start to look at your vision as an affirmation, it takes on a new power to it. And it becomes the guide for the day. And that’s exactly what the vision should do. Now, just to bring this back to the whole point of this, we don’t want let the principle become stale in our lives, because these are the most predicted principles of success, that we’ve been able to identify in years and decades of research of high performers. Rob Shallenberger: So let’s just stay on this principle of the vision, for a few minutes. We just returned from this amazing leadership tour in Africa. We were in Cape Town, Durban, we had a two-day Breakthrough Leadership Conference in Johannesburg, flew up to Nairobi and then over to Kigali in Rwanda. Just an absolutely incredible experience to me with so many amazing people. Well, one of them has become a good friend. I’m gonna call his name, John. For me, in this entire Africa trip, there was a single moment that was probably the most powerful moment of the trip. And it was after the two-day conference was finished in Johannesburg, people were giving us hugs, we were saying goodbye, it was just a great two days with the people. And as everyone’s filtering out, I noticed that John was still there. And John has become a good friend. We were in Durban with him, for a couple of days, we went out on a safari at his preserve that he has, and it was an incredible experience. So we started to become really good friends with John. He’s been through some challenging times, a couple of divorces in his life. And at this point, fairly heavy smoker. Probably around two packs a day or so. And this is a big deal, and he’s mentioned several times while we were on the safari that he wanted to stop, that this wasn’t a part of who he was. Well, at the end of the conference, he walks up, and I’m standing next to a chair, and I see an arm reach across me, and on the chair, I see this arm put a pack of cigarettes on the chair. And then I see a lighter get put on top of the pack of cigarettes. And I look over, there’s John standing next to me. And he said, “Rob, thinking about my personal vision, this no longer aligns with my personal vision. And that right there is the last pack of cigarettes I will ever touch, for the rest of my life.” He gave me a hug and walked out of the room. And I’ll tell you what, Thomas, the other BYB presenter, and I, we just kind of stood there, almost in tears, not even really able to talk for almost a minute. It was such a powerful experience to see that. For him, he was starting to plant the seed of a vision. He felt the power of that principle in his life, and it was life-changing for him in that moment. Now, he still has the road ahead of him. It’s not gonna be easy to do that. Rob Shallenberger: It’s having that vision and planting the seed and when it becomes powerful enough, we can start to make those kinds of changes in our lives. And so, the whole point in this is to not let these principles become mundane or become complacent about them. These are powerful! These are what the top 10% of any industry do to get there. Be true to character. That’s the foundational principle that we are honest in all the things that we say, that we do and that our actions align with our words. Vision – be an effective communicator. Well, we never stop working on that. To become a better listener. From Africa, someone wrote Thomas a note, because of this principle – be an effective communicator – when they worked on the five steps to become a master listener, that was so deeply touching and powerful to him, he knew it was gonna change his business and life and his marriage. He wrote a special note talking about how that really did change his life. It was that principle that did it for him. Rob Shallenberger: Be accountable in taking responsibility for our actions. Each of these, combined together, are life-changing. So I would hope that after this podcast, that we will take a renewed, fresh look at these principles. This is why we invite teams and people to focus on one principle a week so that it doesn’t become mundane so that we can look at a different angle than we had before. I mean, just like my vision. This is my entire life, I’m around this all the time. And yet, still, now the vision takes on a whole new spirit as I’ve started treating that as an affirmation in the morning. That’s new, that’s exciting, it brings a new focus and power. Well, we can do the same thing with all of the different principles, as we stay focused on them. And they will create success in every area of our lives. Rob Shallenberger: So, we’re gonna wrap up this podcast, two invitations: assuming that you have a vision, your roles an goals and that you’re doing pre-week planning, consider getting a Fitbit, a Garmin watch or something like that to track your progress and help you physically, maybe even take it up to the next level, from where you’re at today. And number two, re-focus on the power of the principles. One principle per week, and make them a central part of your life, to help with that. Again, I’m gonna come back to where I started this podcast, becomingyourbestuniversity.com. There are some free powerful courses that you can use, right there. You can share those with your friends, co-workers. If you’re a manager or leader in an organization, share those free ones with your team. Some of them may be important enough where they invest in the whole course. Great! They’re just gonna exponentially get better, as a result of that. So we’re grateful for your association, your friendship, your influence in the world. You need to know, the vision for Becoming Your Best is to reach a billion people. That’s not a small vision, and everyone who’s listening to this podcast is a part of that vision. This is not ours, it’s not yours, this is something that we do together, to transform and influence the world. And it’s happening! People are scheduling events in Russia, Jamaica, Central South America, there’s things happening in Asia, China, and so this is something that every one of us can be a part of and the truth is, it starts in our own lives, with living a life by design, rather than living a life by default. And then it spreads out its influence from there to our family, to our friends and then the people who are around on a day-to-day basis, wherever we’re working. Rob Shallenberger: So we appreciate you, we’re grateful for you, this is a powerful movement, and we wish you a fabulous week, wherever you’re at in the world.